There's no doubt about it, Autumn is definitely upon us. The nights are getting darker and the weather is getting colder, which only means one thing - shopping for new Autumn appropriate things! There's nothing like a new season to increase my desire to shop (not that I need a reason) but as I am trying to save for a new Laptop before this one's impending death, I'm trying to cut back on my spending a little bit. So, seeing as there won't be another big haul for a while, I thought a wishlist would be a good alternative - we can just pretend I bought these things! First up is this lovely Jo Malone candle in Peony and Blush. I love Jo Malone, all of their fragrances are lovely, with wild bluebell being my favourite, and their new scent is no exception. It is a pretty dusky floral scent which is great for Autumn if, like me, you aren't a fan of spiced or cinnamon scents. I also love the packaging of the Jo Malone products, it's so sleek and expensive looking, so they always look pretty displayed in my room. Another thing I really want are these pretty ear muffs from Accessorize. My ears get so cold in the winter that I get ear ache quite a lot, so a cute pair of ear muffs are the perfect solution. As you can see my the other items on my wishlist, I'm loving neutral, furry things this autumn and I just think they are so cute and will go with most of my outfits. 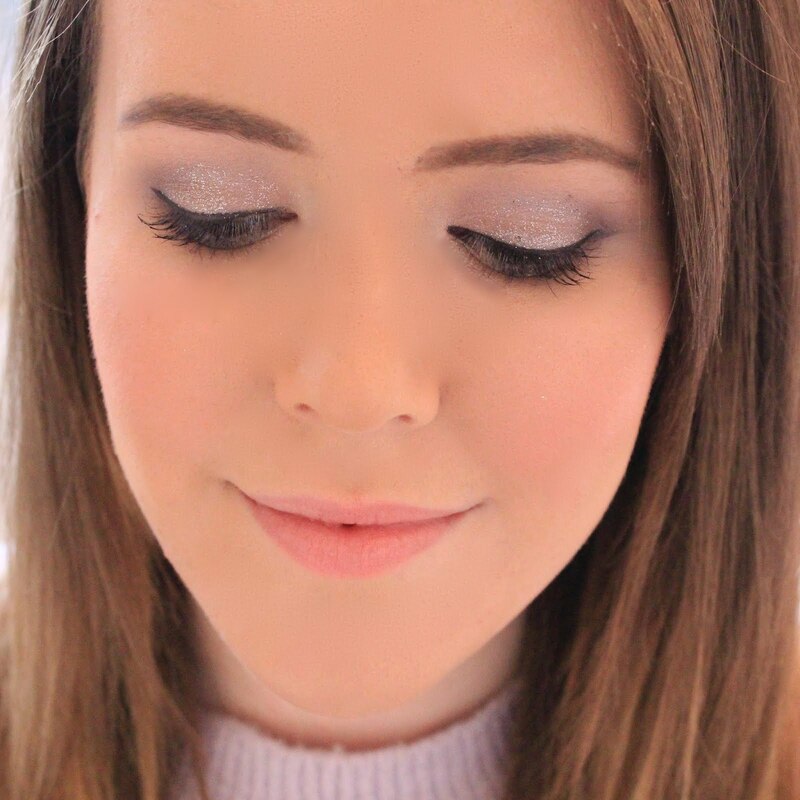 I also love the little sparkly detail - I can't resit a bit of glitter! I love to be warm and snuggly when I sleep, so this hot water bottle cover from Liberty is perfect for me. I imagine the fur is very soft and cuddly and would keep me warm all night. I already own two hot water bottles, but they are both pink so it's not like I'm wanting to buy the exact same thing as something I already own? I also think this Nars eye-shadow palette will be perfect for Autumn. I love all of the warm neutral and earthy tones in this palette as they all look very wearable for daytime looks as well as nighttime looks. I love the golden and the green colour and think they will go well with some of my other eye-shadows, and really, I just can't resist a palette. I always think I'm getting more for my money and I like to have choice when it comes to eye-shadows, and well, any make up. And how could I resist this cute little pumpkin from Lush, I haven't actually been into store and smelled this product so I could hate the smell of it but I just thought it was so cute and would look pretty sitting on the side of my bath with all of my other bath products. I live in my Pajamas when I'm at home, so I had to have some on my wishlist. I love matching sets of cotton pajamas, so these pajamas from H&M would be perfect for me. I love to sleep in shirt style tops and shorts as my arms usually get cold and sometimes longer bottoms annoy me when they ride up, as I move around in my sleep. I love the pastel colour and although they aren't really that wintery, for me, they would be great for winter. And where would I be without a trusty pair of gloves for the colder months. My hands get SO cold during the winter when I'm walking to work or uni so a good pair of gloves are essential. If I had the money, I would invest in these UGG gloves, they cost £110 but are so soft and warm and I know they would last me years. Of course, there had to be a beanie hat included. I love these and although I don't actually own any of my own, I used to borrow my housemate's non stop last year as I loved it so much. I love the bobble on top and think these hats are so cute. I usually wear these when I have my hair curly as I find that hats tend to make my hair look extremely thin and flat when I straighten my hair. Last but not least, a tartan scarf. Tartan just screams winter to me and everyone who knows me knows I live in scarves once the weather has turned icy. I think this would look great with a cream knitted jumper or a pale grey knitted jumper. I've heard they are selling these in Primark for only £4 but I am yet to see one in store, I'm hoping they come in stock soon! Wow, that was a long wishlist - I guess this is what happens when you tell yourself that you can't shop, you just want to buy everything! I'd love to know what your picks are for A/W so let me know in the comments below! OMG I've been lusting after cute little jammies too! I love those blue ones!! The Lush pumpkin is so cute! I need a beanie had too. That NARS palette is beautiful, I don't own and NARS shadows & think these palettes are really good value for money. 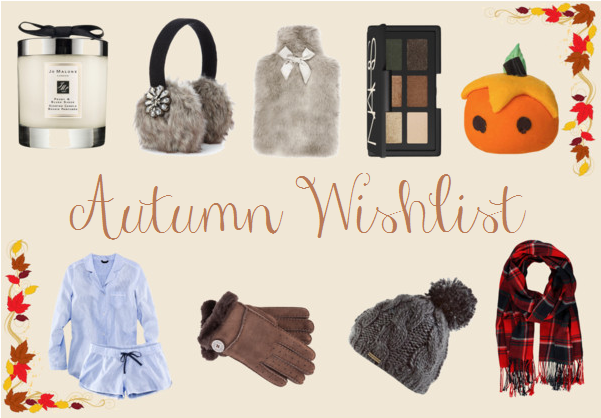 Love this wishlist- everything is so perfectly suited for autumn and winter! That PJ set is adorable!